Sam’s Dance, Rose Royce, and Vancouver Women’s Health Collective have a fresh new idea for engaging people in our city in the summer of 2018. We hope you will consider sponsoring this innovative project to inspire and invigorate the people of Vancouver. Dance in Transit will entice all kinds of people out of their homes, whether new to dance or already part of the dance community, whether they are young or old, shy or socially awkward, new to the area, newly retired, recently divorced, feel restricted by health issues, or immigrants. We are not just another dance school or event promoter. We are community builders and activists who foster community development and cultural diversity. 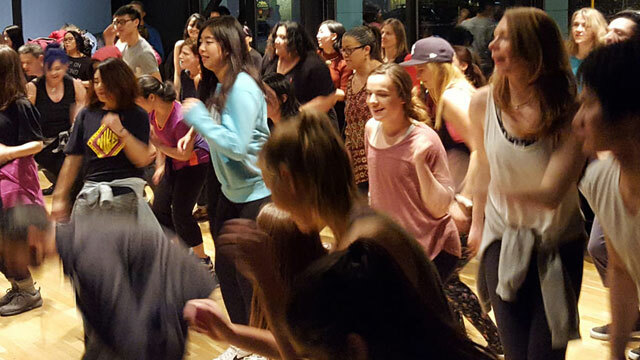 Dance and music can help bring our community together to create stronger ties between us! 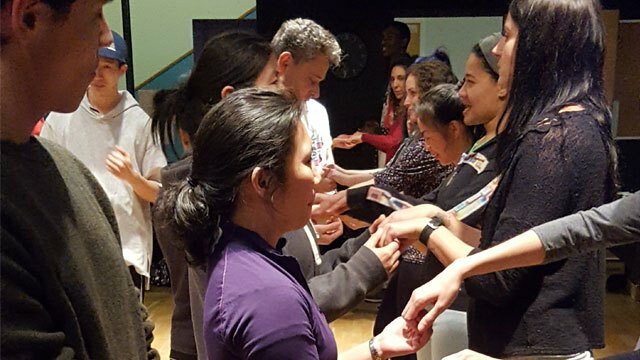 We believe social partner dancing is a way to connect with people who feel excluded from their own communities. It is also a proven way to increase fitness, and improve brain functions and quality of life more than other activities like yoga, cycling, hiking, running, and crossword puzzles. Dancing increases neural pathways like none of these other activities can and it has the added bonus of helping people to find friends and forge relationships they would not have otherwise. The community we envision will also support networking for employment and business opportunities. Dancing is a way for people to move away from their digital devices and reconnect with people face-to-face. Social skills like conversation and casual physical contact are disappearing because digital communication can be so isolating and pervasive. The less we connect with real people, the less we care about their welfare and the less we care about our society. Music and dancing bring people together in real life! Sam’s Dance is an incorporated company, wholly owned by Patricia Hardin. Patricia started her own dance school after discovering dance in 2012, then finding local dance schools unsatisfying and exclusionary. She thought she could provide a space for fun, healthy movement and friendship that was different from all the others. Rose Royce Group is a registered company, wholly owned by Nick Guarna. With over 20 years of solid experience, Rose Royce Group is an award-winning and extraordinary “Professional Entertainment Hosting and Management Company” currently operating in three primary business segments: event hosting and management; DJ and musical services; and dance programs. The company brings a fresh and innovative approach to entertainment events and its goal is to exceed the expectations of every customer by producing enjoyable and memorable events with style and originality, while focusing on outstanding customer service that brings excitement and joy to participants. Vancouver Women’s Health Collective is a non-profit organization serving women and families since 1972. VWHC provides advocacy, medical services, and wellness programs for all self-identified women. Research has proven that arts and culture provide many health benefits that have been largely unrecognized until now. Dance is the best activity for brain and body health as well as social wellbeing. 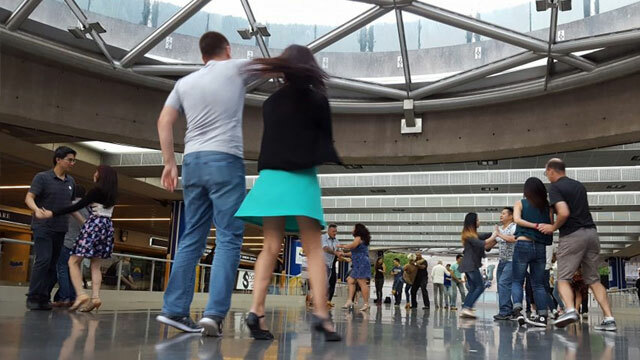 VWHC is pleased to partner with Dance in Transit to bring dancing to everyone! To host FREE events throughout the spring, summer, and fall of 2018 in various outdoor venues. To promote dance as a healthy, safe, social activity and a way to form new relationships. Events will be held according to a schedule we create, during weekend days and evenings. To utilize a combination of regular, predictable venues, like Robson Square, Granville Island, Jim Deva Plaza on Davie Street, and other open-air spaces on a rotating schedule. Managing partners Patricia Hardin from Sam’s Dance and Nick Guarna from Rose Royce will plan, organize, and execute this project, along with other partners, sponsors, and volunteers. To be inclusive of locals and tourists, dancers and non-dancers, the physically fit and physically challenged. To utilize community spaces that are accessible to everyone. To engage societies that serve marginalized populations: Parkinson’s Society, Arthritis Society, etc. To bring more music and dancing and laughter and spontaneity into the lives of our citizens and those experiencing our city as visitors. To promote Vancouver as a fun city! Each event will feature mini-classes in specific dance styles, demonstrations, and social dancing to beautiful multi-cultural music. Outdoor venues that are open air will be covered by a large tent to prevent cancelation due to inclement weather. Sponsors to help with rent and other costs (teachers, performers, DJs, printed materials). A sponsor to provide speakers, mixers, and cables. Sponsors to send emails promoting each event to their customer databases. Parking spaces near each event so we can bring the materials we need each time. Help from the City of Vancouver with permits, access to venues, and permission to exceed 10 pm noise limits for evening events. Partnerships with vendors to provide amenities to attract people and keep them at the events: popcorn sellers, cold drink vendors, cookie makers. We plan to provide a variety that changes for each event, which would also give many vendors a chance to participate and engage more local businesses. Access to washrooms and staff to maintain them. Some tables and chairs, if space allows. Access to radio stations, newspapers, social media, and other means of advertising this project. Giveaways and prizes for raffles. Overhead cover for open-air spaces, including set up and take down, to prevent cancellations due to weather. Expertise in how to plan, manage, and execute these events. Volunteers to help with event days. Teachers to demonstrate dances, teach the movements, supervise safety, and encourage participants to dance with us. Performers to showcase different dance styles. DJs to provide and play the music. Contacts in the dance community. Partnership with a non-profit organization. Marketing with posters, postcards, and social media promotion. Access to thousands of participants throughout these summer events. A customized package of print and social media recognition. Posts on Facebook, Instagram, Twitter, Eventbrite, and Meetup. Posters displayed at each event. Prominent placement on our website. 2.Announcement of your support at each event. 3.A link to your website on our website. Announcement of your support at each event. A link to your website on our website. $1,000 per event is our IN IT TO WIN IT Package with all the above benefits, plus customized extras. We hope you will consider supporting this innovative project to promote vitality, healthy movement, music, multi-culturalism, diversity, and pure fun in Vancouver. We are available to answer any questions you may have or to discuss the options. A table at each event to talk to people about your business, sample your products, and hand out your advertising materials.